Although Yarden, our son who has autism, participated in a group ceremony with his class, it was important to us for him to celebrate his bar mitzvah within our own congregation. 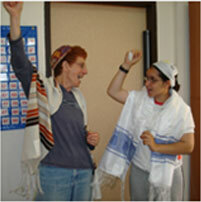 This meant that Yarden would chant the Maftir and Haftarah and give a short drasha on a Shabbat morning. While Yarden reads fluently, and is blessed with absolute pitch and musical abilities, his ability to concentrate is limited and it is especially difficult for him to change his daily schedule to include new tasks, in this case studying at home after school hours. Yarden’s teachers utilized a computer program with both visual and auditory components. The trope in the text was color coded and when the mouse was moved over the text, the melody was sung. We began working with him daily after school. However this sometimes led to outbursts of screaming that shook us (as well as the neighbors). His teachers came to check on his progress once a week, and to rehearse the order of the service. Although Yarden was fond of the teachers, the changes in his schedule upset him greatly. We discovered, that Yarden loved the singing and dancing that would be part of the ceremony, and rehearsing this made the sessions doable. Yarden was accustomed to going to the synagogue every Shabbat, but often needed to go out for short periods. 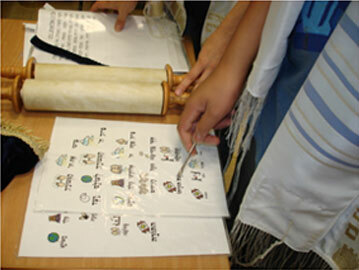 His teachers broke the service down to its different parts, and had each prayer written on a strip that was attached to a board with velcrose. When a prayer was over, Yarden would turn it over, and in this way he knew what the order was, and how many prayers there were until his favorite “Adon Olam”. Progress was slow, one step forward and one step back, with Yarden cooperating one day, screaming the next. The Friday evening before the big day, Yarden (who was often a star performer at his school) expressed his apprehension before going to bed by saying “no bar mitzvah tomorrow”. In the morning, when we arrived at the synagogue, Yarden initially refused to go in, and began screaming at the top of his lungs. We went into a side room, and he calmed down and accompanied his teacher into the sanctuary. The minute he saw the congregation, the microphone and the familiar words of the service, he began to cooperate happily. He sang the morning blessings, the Halleluja and read his Maftir and Haftarah perfectly and with a great deal of pleasure. He read his drasha, which included a prayer he had composed himself, while his face shined with pleasure and pride. When we reached the moment when the family recites the “shehecheyanu”, we asked everyone in the congregation to join with us. The service ended with Yarden singing his beloved “Adon Olam”. After the service, many people approached us and told us that this service was a most spiritual experience for them. It came from seeing Yarden overcoming his difficulties, and expressing a prayer from deep within. We also had a party planned to take place in a club including a musical group that was going to perform. Here too, the event began with Yarden screaming to be taken home, and even ripping the buttons off his shirt. (This again, was a reaction to a change in his daily routine). But, the minute the music began, and Yarden was invited to come up on to the stage, he joined the group, singing as if he had been practicing with them for weeks, thrilling all the guests. In spite of all the tension, Yarden performed beyond our wildest dreams. We know that this was the best gift that we could give him as he turned thirteen. Yarden watches the video of his party endlessly, and still enjoys going to shul on Shabbat. We feel that we enabled Yarden to have an experience in common with all young people who celebrate their bar/bat mitzvah. 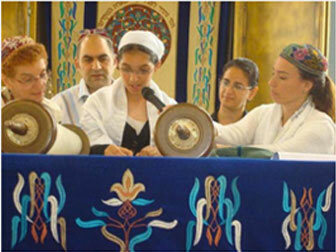 Last Thursday we celebrated our son Itamar’s bar mitzvah at the “VeAhavta LeReacha” synagogue. The care and welcome extended to us by the community with the help of Masorti Movement is the best example of “loving one’s fellow man” that I can think of. Over the past few years we debated how best to celebrate Itamar’s bar mitzvah. We were fearful that it would be a painful and degrading experience for him and for us. We were delighted to hear about the possibility of celebrating together with Itamar’s classmates, their parents, a supportive rabbi, and a caring community that accepted and welcomed us. Itamar’s bar mitzvah was one of the most joyful events in our lives. We felt very much a part of the community. Itamar had the opportunity to learn about and experience customs such as putting on t’fillin, and reciting the Shma. The preparations for the ceremony were most professional and Itamar was ready for this event. We were pleasantly surprised by the amount of knowledge he gained and expressed. The process of composing a prayer to share with Itamar that I did together with you was a wonderful opportunity for me to deal with both the positive and painful emotions that accompany this rite of passage. I want to thank all those who contributed to this successful ceremony – the donors, those who taught the youngsters and offered support to the families, and to Rabbi Elisha and Professor Shlomo Meital who conducted the ceremony. You gave Itamar and all those who love him the gift of a lifetime. I will be happy to help you so that other children with special needs can have this experience as well. My son Ran lives in Beit Uri, a hostel or more accurately a small village, in Afula for persons with mental retardation. I traveled there this week in order to participate in t’fillot (services) during which six residents were called up to the Torah. The ceremony was the result of a wonderful project of the Masorti Movement in Israel which has taken place at Beit Uri every year for the past ten years. The ceremony represents the culmination of a year of intense and hard work on the part of the teacher, who finds creative ways of enabling each resident to participate as fully as possible. I am not a religious man, yet I was deeply touched, even though this was the second time I had attended such a service and I had convinced myself that this time I would be less moved… Still, I couldn’t help but be caught up by the great excitement of the residents, who were so proud of their achievements. They sang and danced with so much enthusiasm, that even my son, who is 33 years old and who is generally cut off in his own world was stirred. For the first time in my life, I saw him move his feet as a song was sung. Was he trying to dance? For the first time, it seemed to me that he was moving his lips in an attempt to join the singing (he doesn’t speak at all). But for me, the most amazing experience was to watch the facial expressions of the wonderful teacher who tried to coax each of his students and involve them. First his face was marked with intense concentration, full of anticipation and expectation and later it shone with joy, reflecting his students’ achievements. The sight caused me to think and reflect. The world of persons with retardation is so full of difficulties. Those who are fortunate are surrounded by “good souls”, people who are willing to invest every effort to help them and who understand the true magnitude of every achievement, even the tiniest step forward. Only a person who is close to this world can understand the significance of this. And perhaps being a part of this world enables us to view life from a totally different perspective.